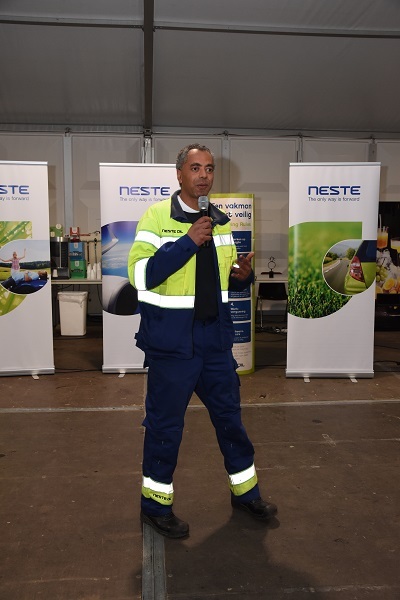 Neste receives recognition from its contractors as they vote the company as the recipient of a safety award in the Netherlands. According to the jury, contractors enjoy working with Neste due to the positive atmosphere and mutual trust on each side, which are both important factors in creating a safe working environment. Acts such as respecting the professionalism of individuals is an important factor when collaborating with others. “If a crane operator tells us there is a better way of doing things, we listen to them. It is not about getting things done our way, but getting them done the best way,” Hanno explains. Hanno also recognises that an open and nonhierarchical working culture helps with improving safety. Communication does not merely happen from the management to superiors, but it flows in all directions. “We want to give honest feedback, but also do our best to encourage individuals to give management feedback as well. It is important to make time to listen what people have to say,” Hanno clarifies. Hanno is yet to decide where to situate the award, but is looking for a place for it where everyone on the site can enjoy it. Hanno Schouten surprising employees with the news that they have won the VOMI Safety Award.